An accomplished Attorney-at-Law and Certified Anti-Money Laundering Specialist, Tasha Manley is General Legal Counsel for The Jamaica National Group. She assumed this position in September 2016. Prior to this appointment, Ms Manley was employed as Chief Compliance Officer at the Jamaica National Building Society (JNBS), since July 2011. In that role, she had oversight for the global Anti-Money Laundering programme and the broader regulatory compliance framework for the JN Group. 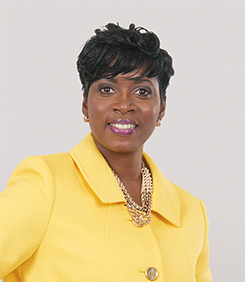 Former Crown Counsel in the Attorney General’s Department, Ms. Manley has represented the Government of Jamaica in all local courts and has appeared before the Judicial Committee of the Privy Council in the UK on two occasions. She has worked as an International Fellow at the Commodities Futures Trading Commission, Washington DC. She has also served as a Director on a number of public sector Boards, including the Development Bank of Jamaica, chairing the board’s Audit Committee; the Chase Fund (later serving as Corporate Secretary); the Jamaica Civil Aviation Authority and the Water Resources Authority.